Japanese beetles arrived in North America around 1916, and gardeners have been battling them ever since. While it's almost impossible to completely eradicate these pests, a comprehensive approach to their control can minimize damage. Learn about different ways to rid your garden of these pests. If you prefer to avoid using pesticides to kill beetles in your garden, give one or more of these methods a try. 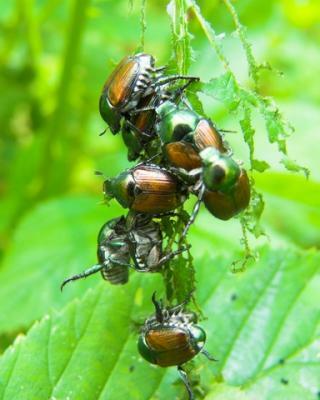 Gardeners have come up with many ways to kill Japanese Beetles. One of the most effective, albeit tedious, ways to get rid of the beetles is to hand pick the adults off plants and kill them. Just drop them into a container of soapy water as you remove them from your plants. While this might not sound effective, it does work. This organic control method is becoming popular with gardeners in many areas. Milky Spore reduces the population by interrupting the lifecycle of the beetle, but it is not an instant fix. 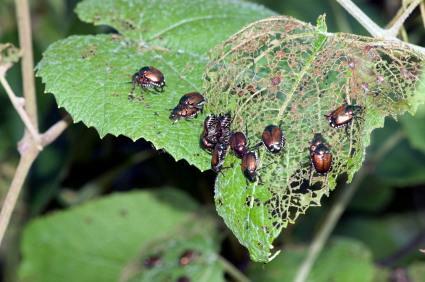 You'll still need to continue hand picking adult beetles off your plants. Apply Milky Spore powder to the ground in your garden in late July or early August. The grubs of the Japanese beetle eat the powdery bacterium, and it kills the grub by multiplying in its system. Once the grub is dead and begins to decay, the bacterium are released back into the soil and other grubs eat it. This creates an ongoing cycle which can protect your garden from the Japanese beetle. Since the Milky Spore bacteria are living organisms, they continually regenerate themselves as they feed on the beetle grubs. The bacterium can last for up to ten years, it's safe to use around children and pets, and it's non-toxic to wildlife. The powder can be found in many garden shops and on the Internet. Some people swear by Japanese beetle traps while others insist they entice more beetles to the garden than they capture. Traps work through scent lures, either mimicking the sexual scents of female beetles to lure only males or a general scent that entices both sexes. The beetles enter the trap, crawl into a bag or jar, and cannot crawl out. Simply discard the bag and the beetles, and replace the bag when necessary. You can give this method a try and see how well it works for you. Nematodes feast upon beetle grubs. They inject a bacteria into the grub, and then feast on the multiplying bacteria, which kills the larvae. Neem comes from a tree that grows throughout Asia, and many organic pesticides contain this natural oil. Neem may not kill the beetles, but it does repel them. It also offers some protection against black spot and fungal diseases. 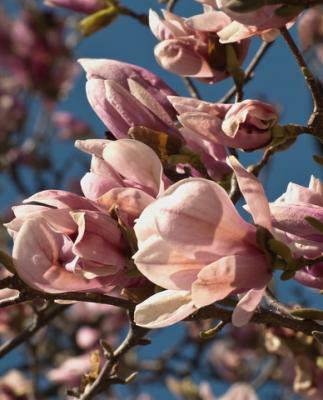 You can also plant trees, shrubs and flowers that are resistant to Japanese beetles and will discourage these pests from living in your garden. Although they won't provide absolute protection, they will decrease the population by limiting the beetles' food sources. The U.S.Department of Agriculture's handbook on Managing the Japanese Beetle recommends several pesticides to kill Japanese beetles at their adult and larval stages. Check with your local County Cooperative Extension office for a list specific to your area. 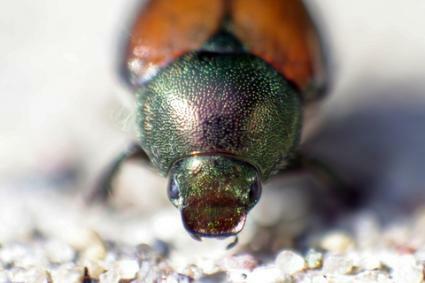 Many beetles become resistant to pesticides over time, and local Cooperative Extension agents know which pesticides generally work in each area. Pesticides recommended for adult beetle control include carbaryl and malathion. Check with your local nursery or extension office for more recommendations. Always use caution when applying pesticides. Keep children and pets off treated areas for as long as the pesticide package label recommends. Check your local nursery for other lawn products suited for controlling beetles. 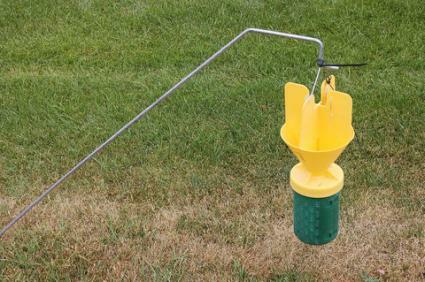 Many products contain blends of the aforementioned chemicals, along with other ingredients to feed the lawn while simultaneously killing larvae. Killing Japanese beetles may be an ongoing part of gardening, but having a long term plan, using natural control methods and keeping your plants healthy will help overcome these pests over a period of time. Be consistent in your defense against the Japanese beetle, and their numbers will dwindle. If you can get your neighbors to join with you in a synchronized effort, the beetle could well be eradicated in your entire neighborhood.